To find a suitable opportunity in the clinical research and medical writing industry, where I can contribute towards the overall growth of the organisation. 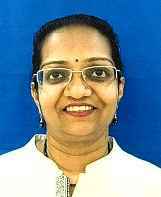 Nalini has demonstrated very good knowledge of medical writing during her program. She is a skilled writer with an eye for detail. She always reached out to the faculty for any clarifications to ensure that she had understood the study materials. We wish her good luck. I have done my bachelor's as a double major in Life Sciences and Biochemistry and my masters in Life Sciences with Bio Macromolecules as my specialization. My doctorate degree (Ph.D. is in Life Sciences with specialization in Plant Molecular Genetics. For my Ph.D. I worked at Bhabha Atomic Research Center, Mumbai. Then I worked as a research scientist for two years and senior research scientist for two years in Dhirubhai Ambani Life Science Center, Navi Mumbai. I am a jovial person with cheerful disposition. I like team work. I like to meet people and I like to make new friends. I am married and have one daughter. I am interested in molecular biology, plant molecular genetics, clinical research and medical writing. I was involved in basic research in my previous job and continue liking it. I am also very interested in clinical research and would like to make a career as a medical writer. I am singer and have learnt Carnatic music for 10 years. I play the keyboard. I have also given several stage performances in light music. I love reading books. I love socializing and meet friends. I chose JLI particularly because I was looking for a course in clinical research and medical writing which is entirely online. JLI is also a very reputed institute and are accredited. My experience with JLI is wonderful. I am very happy with their study material and the way they respond to our queries. After completing my program I would like a job as a medical writer, part time or home based. My key strengths are my ability to work independently and in a team. I am always punctual with my assignments. I have an ability to make good notes. The program curriculum is very good and vast. I will always recommend this program.